Apart from the last few years - 2007 onwards - the early 1970's was the busiest time of my life for travelling by train. 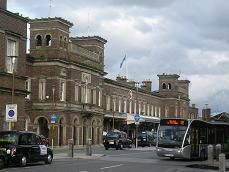 In September 1969 I started going to school in Birkenhead by train, catching the 7.55 am train from Upton-by-Chester to Birkenhead Central, changing at Rock Ferry. I then returned on the 4.30 pm train from Rock Ferry if I was lucky. If I missed that it was a 3/4 hour wait until the next train at 5.15pm. Nine times out of ten the unit would be a Metro Cammel DMU. I would do this journey six days a week, including Saturdays, though usually we finished at lunchtime on a Saturday. This lasted until 1976 when I finally left school, so you could say I was a schoolboy commuter. The early 70's also saw me as a keen train spotter, travelling frequently all over the north west of England, with occasional train trips to London, Birmingham, Derby, Sheffield and North Wales. There were also holidays in Kent, Hampshire and in the West Country, which led to the Western Region of British Rail becoming my favourite BR region. 9/4/71 (Good Friday) - Went up to Preston by car from Chester to visit my Aunty Joan. Whilst there I visited Lostock Hall shed. 18/4/71 - 10.15 Chester to Crewe. 16.40 Crewe to Chester. Train spotting at Crewe for the day, including visits to the diesel depot and the works. 11/7/71 - 17/7/71 Went away for the week to stay at my Aunty Joans in Preston. Each day I would go and walk round Lostock Hall, as well as wlking across the fields to train spot on a cutting next to the West Coast Main Line. Chester to Crewe. Crewe to Birmingham. Birmingham to Oxford. Oxford to Didcot and return. Didcot to Swansea and return. Oxford to Didcot and return. Didcot to Swindon and return. Oxford to London Paddington and return. London Kings Cross to Cambridge and return.